Subject: Plate: 'Monument de Wolf et de Montcalm, a Quebec'. 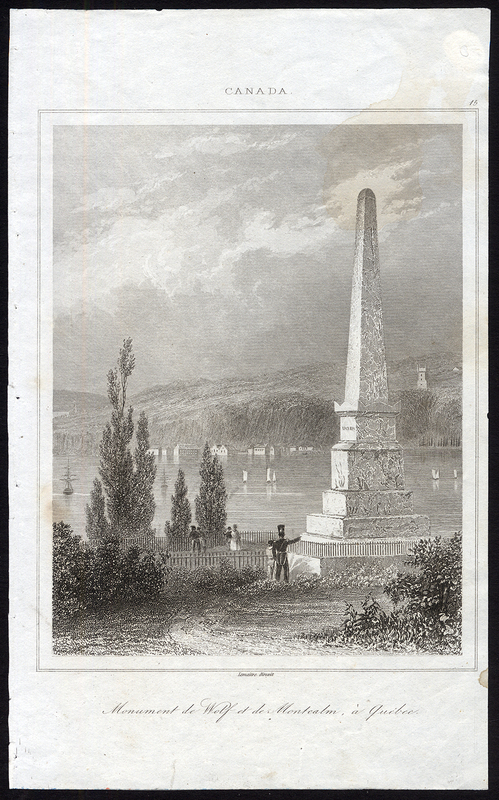 This plate shows the Wolfe and Montcalm Monument in Quebec, Canada. Condition: Fine/good. General age related toning and light staining and/or soiling from handling. A few spots / stains. Some light creases. Small wormhole top margin; backed. Small repaired tear bottom edge. Please study scan carefully. Size (in cm): The overall size is ca. 12.5 x 20 cm. The image size is ca. 11 x 14.5 cm. Size (in inch): The overall size is ca. 4.9 x 7.9 inch. The image size is ca. 4.3 x 5.7 inch.